Inverter air conditioning QLIMA in addition to the other for inverter models boast standard features with greater added value. 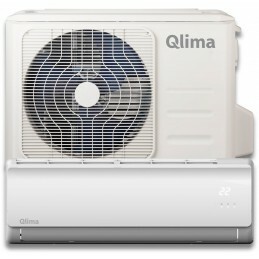 Heat exchanger in the outdoor unit air conditioning QLIMA is also coated with Golden Fin ™ coating that prevents corrosion of it due to external factors such as natural impacts from road salt, acid rain, etc.., Accompanied by significantly extended service life. In addition, it also improves the efficiency of heating systems and accelerate the process of defrosting the compressor. The outdoor unit has a built-in PTC heater housing unit and the compressor shaft. In winter, when the device is used for heating-only to prevent freezing tray and mouth discharge of condensation and provides a smooth start-up and operation of the device even in extreme winter conditions. Advantages of PTC heating elements are very quick to respond when switched on, the safety element of self-restraint highest temperature, the value of which is due to semiconductor and ferroelectric properties of the material is independent of the electric current, stable maintenance of the desired preset temperature, and, consequently, extremely low power consumption. Our atmosphere with innovative inverter technology reached the set temperature only switch to a lower level of activity. Room temperature to almost nothing fluctuate. Inverters maintain the set temperature with minimal power consumption, the peak comes at the time of each compressor start. The advantage of our new inverter is its significantly quieter operation. Since our inverters so carefully follow the energy, the less strain on power grid and consume 35% less electricity than conventional models. Operate with refrigerant R410A and have much more power heating and cooling than conventional models built.